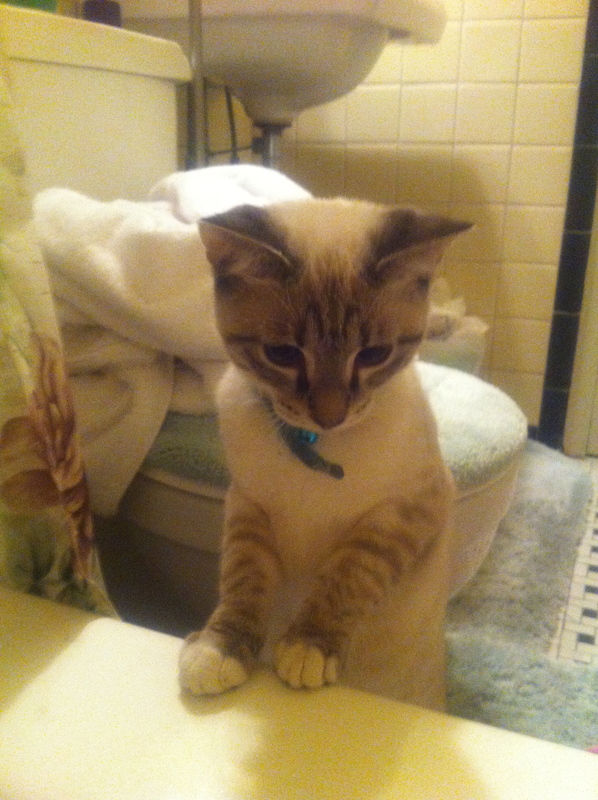 Zelda creepin' on me in the bathtub. Here is a second version of my new Scent Diary feature, with a different format from the first. Please let me know which one you prefer! Wearing: Botrytis Ginestet. The combination of warm honey and bright white floral notes has been perfectly matched to this recent slew of sunny-but-freezing winter days. 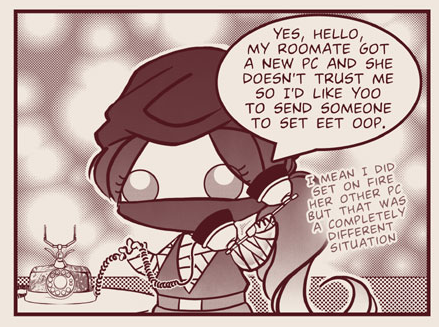 Reading: Springiette, the cutest webcomic about a lady-ninja and her pet sushi ever. The fact that it is most likely the only webcomic about a lady-ninja and her pet sushi does not in any way detract from its cuteness. Springiette is the (adorable) copyrighted property of María Victoria Robado. Watching: Star Trek: The Original Series Season 2, now that my beloved little brother Buzz has finally gotten Netflix working on his Wii. 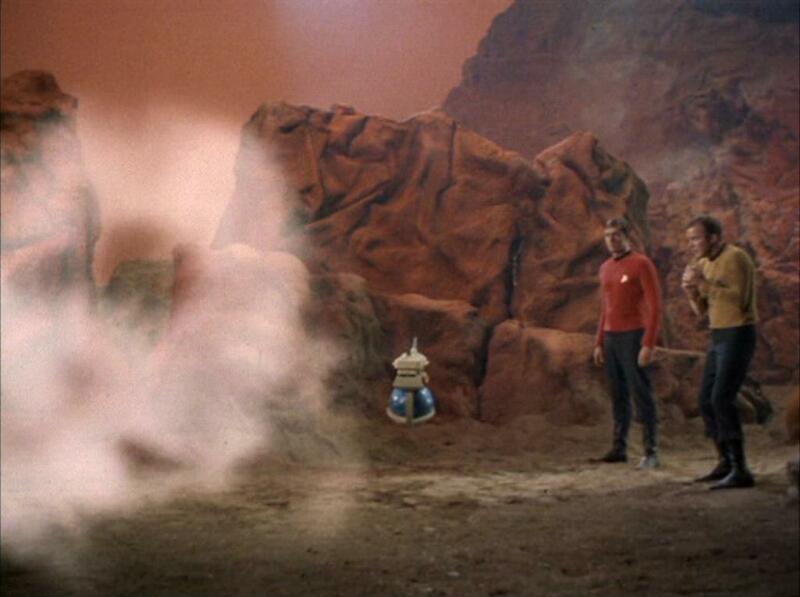 Last night’s episode was “Obsession”, in which Kirk goes all Captain Ahab up in here and starts tracking a gaseous cloud that smells like honey. Buzz and I agree that this honey cloud is quite possibly the lamest villain of all time, with the possible exception of Team Rocket. As if being honey-scented wasn't threatening enough, the cloud also sparkles. I don't even know. Lusting After: Some CB I Hate Perfume Burning Leaves, which is on sale at The Crushed Violet. I’ve never tried it before, but I love smelling burnt anything (coffee, marshmallows, halloumi cheese). 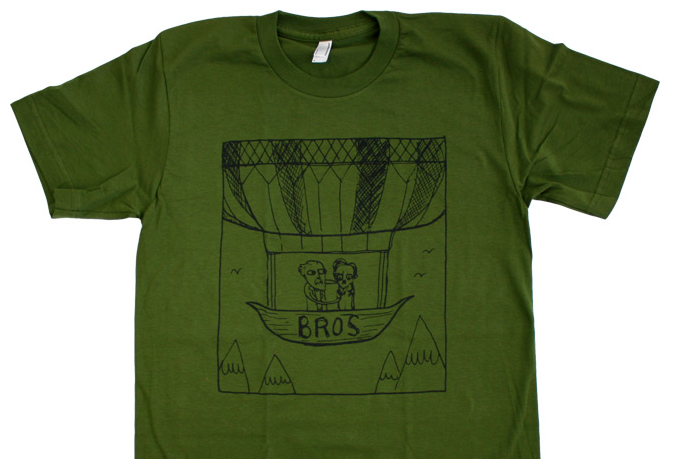 I would also cut a distant relative for this “Bros” shirt, which depicts the epic bromance between authors Jules Vernes and Edgar Allen Poe. 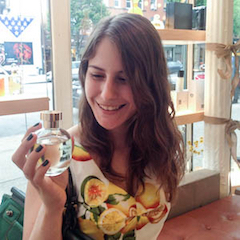 Cheering For: My fabulous reader breathesgelatin, who is getting her brand new perfume blog up and running this weekend! I’ll update this post with a link as soon as she’s ready. ‹ PreviousResults of Serge Lutens De Profundis Giveaway! Vanessa, thank you for your input! I am actually more uncomfortable with the first one, because I hate feeling like I am blathering on about myself. But since an overwhelming preference has been shown for the first style, I will defer to the will of the people! I’m somewhat indecise about what I should do. I’m an indecise human! I think I prefer the TEN minute speech, but still don’t know…. Verne’s idolization of Poe was soooo cute! The first version it is! Thank you, Irina! For more of a “most weeks” blog – I tend to prefer the first one – but every now and then, life just might lend itself to the second type. I honestly can’t believe that y’all like the first version better! I thought that it was awkward and boring! I’m really glad I asked. I… kinda like this version. But that may be because I heart Kirk. I heart smarmy, punny, arrogant, toobigforhisbritches, occasionally-shirtless Kirk right down to the ground. Can’t wait to see breathesgelatin’s blog. The puns are the best thing about Kirk. Chekov is also great with the puns. Nuclear wessels! Also chiming in for the first! I am in shock! Thank you for chiming in, Meg! I’m a bigger fan of the first, but the second comes with pictures of Zelda AND Kirk. Such a quandary. The other version will include pictures next time too! Don’t let Kirk sway your judgement! Both versions are great but good special features is definitely the way to go. That presentation is more crisp, and it definitely flows, yes. I am sooo sorry, I totally agree. The first version had too much drama! That week was more stressful than average, so I’m hoping that future versions will not be as bad! This is really tough. Would it be too greedy to ask for both? If so, I’d have to go for the first because I like hearing about what you are getting up to in general. As for “burnt” perfumes you just have to try Aomassai. The burnt caramel in that is just the best. Oh and glad you like Botrytis too. Tara, I have now tried Aomassai three times, and I still don’t find it “burnt”! I like it, it smells very pleasant to me, but all I get is walnuts. I wish that I got the delicious scent that everyone else describes it as. Thank you so much for weighing in! Either one is fine, but I think we get more of a personal view into your life in the first one – so it all depends on how much you feel comfortable sharing. And get the Burning Leaves! I’ll take some off your hands if you don’t like it ; ) I have a large sample and absolutely love it in fall/winter. It is not too burn-y though – I don’t get much smoke, which is good since I’m not a fan of that in fragrances. I procrastinated too long on the Burning Leaves! It’s sold out now 😦 And CB I Hate Perfumes doesn’t do samples! Well, they do $12 samples of the parfum formulation, which is not particularly useful to me. The Perfumed Court has samples – both water perfume and absolute. Although I know you are not a fan of the online ordering!